Cuscus or Vetiver- Chrysopogon zizanoides -is an erect, perennial, in grass family, grow up to 1 to 1.5 meters high, leaves are long, thin, length up to 150 cm and 0.8 cm wide. 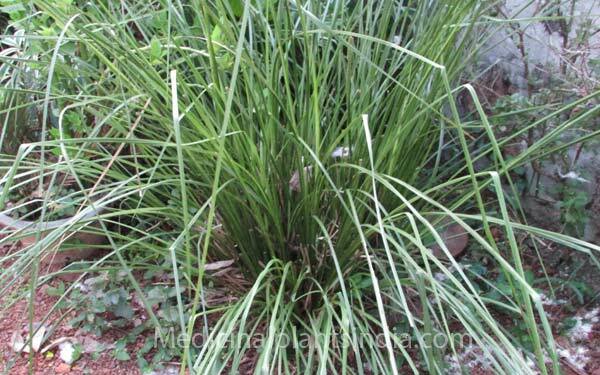 Stems are tall and the flowers are brown or purple, roots can grow 2 to 4 m downward in depth. The leaves can become up to 120 to 150 cm long and about 0.8 cm in wide. severe stomach pain, vomiting, rheumatic arthritis, skin disorders, and it has an antiseptic property to treat acne and sores. Chemical content: benzoic acid, vetiverol, furfurol, vetivone a, vetivone b, vetivene.